The UK’s National Security Capability Review (NSCR) was released without much fanfare in March 2018. Rather than open it up with a parliamentary debate, it was just stated via a Written Ministerial Statement, then posted online on the gov.uk website. Along with the NSCR, a Cross-Government Funds Review (also not debated and released in a Written Statement) was published, basically a summary of the Prosperity Fund Annual Report 16-17 and the Conflict Security Stability Fund (CSSF) Annual Report 16-17. In this article, I’ll be concentrating mostly on the NSCR and partly on the upcoming Modernising Defence Review (MDP). identify how we [the UK] could develop, deliver and deploy our considerable national security capabilities to maximum collective effect.
. The Joint Committee for National Security Strategy (JCNSS) gave a stronger and more closely-examined an excellent investigation on how the NSCR came about (see National Security Capability Review A changing security environment pp.8-19.) A written evidence to the House of Commons Defence Committee also provides a succinct timeline how the NSCR and later the MDP came about. Basically, the NSCR took a really long time to come about from April 2017 to March 2018, probably longer than SDSR 2010 and SDSR 2015. One should also note that the 2017 annual report of SDSR 2015 is also mixed within the NSCR. Previously, the 2016 report or Corporate report was published as a separate piece. Stepping back, the NSCR is unique as this is the first review of a SDSR and maybe even all British defence reviews. Ok, previously, there was a New Chapter added to the 1998 Strategic Defence Review but I wouldn’t consider that a review of a review. It certainly is confusing. What is this NSCR anyway? We will strengthen our overseas network so that we can reinvest in our relationships around the world, champion the rules-based system including free trade and use our soft power to project our values and advance UK interests. Out of all the streams, the Fusion Doctrine is perhaps the most prominent and most peculiar stream. Defence and national security commentators online have indeed made comments, mostly jovial about it. According to NSCR document, the Fusion Doctrine (I do not want to abbreviate it to FD) helps to further draw in NSC ministerial members to strength a collective approach towards the three NSC aims or priorities: 1) Protecting our [the UK] people; 2) Projecting our [the UK’s] influence [abroad] and 3) Promoting our [the UK’s] prosperity. It is based on a post-Chilchot inquiry approach, especially through the MOD-created document, The Good Operation. According to the NSCR, “Many capabilities that can contribute to national security lie outside traditional [British] national security departments” therefore there is the need to draw in all possible national security-related tools to bear. This Fusion Doctrine nevertheless brings up the question: Why form it when the UK’s NSC was formed back in 2010 for the same reason? This question was post to the National Security Adviser, currently Mark Sedwill by Defence Committee by MP Gavin Robinson. Sedwill replied that it is a “step forward” from the NSC “building on it” as the UK deals with more intensifying threats and address “modern deterrence” issued, however you define what that is. He goes on to give the example of the response to the Salisbury chemical attack to prove how the Fusion Doctrine was used–the response took place before the full investigation was completed and therefore it occurred at a faster pace and with stronger allied support. 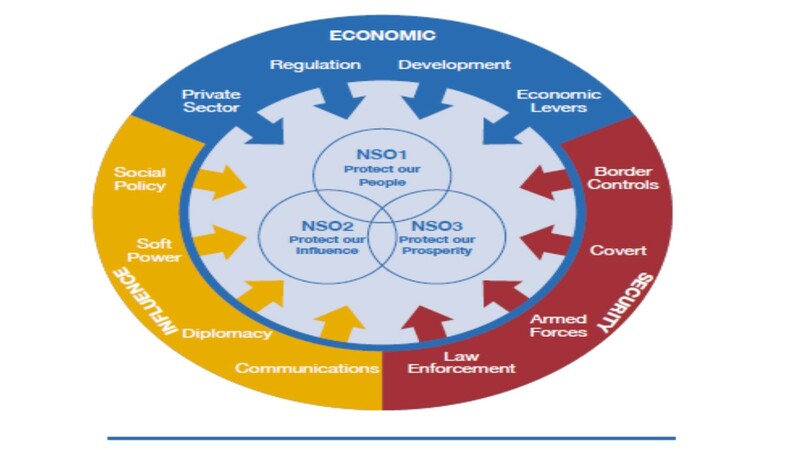 The Fusion Doctrine therefore dominates other parts of NSCR especially in the topics of ‘Economic Security, Prosperity and Trade’ and ‘Cross-Government Funds’ and will most definitely be the basis for future UK national security documents. What is missing or what wrong with the NSCR? As mentioned, the JCNSS report gave a very extensive evaluation of the NSCR, but it was published 11 days before the actual NSCR came out. I’ll try not use the same criticism the JCNSS used but rather choose four topics 1) criticism of the Fusion Doctrine (with reference to diagram above); 2) the lack of a review of the National Security Risk Assessment and 3) the fact that the NSCR is ‘fiscal neutral. The Fusion Doctrine puzzled many when the NSCR was published; some commentators online gave snide comments, others humorous. You can check twitter or other social media platforms to find out. On a more serious note, I too was puzzled and wondered the same questions that MP Gavin Robinson and the answers provided by Mark Sedwill hasn’t satisfied me. Surely there has been whole-of-government response during pre-NSCR periods? Global events and crises such as the 2011 Libya campaign, the wider Arab Spring, sectarian violence in Syria and Iraq, Russia’s illegal activities in Eastern Ukraine and annexation of Crimea all were approached via different UK government departments and organisations. There has been joint up efforts by various departments such as through the CSSF and its predecessor, the Conflict Pool, was created long before the NSC or the Fusion Doctrine came about. The announcement of on this further joint-up approach towards any threat to the UK or national security issue doesn’t appear to a unique positive contribution. Using the examples of the Salisbury chemical attack and the US-UK-French strike on Syria, the joint-government department approach in both cases in my view is no different from pre-Fusion Doctrine approach. Sedwill mentioned they reacted faster in the case of the Salisbury attack–instead of waiting for a full investigation, they approached it by showing the Russian government what the cost of such an attack would be, ie, placing a wide range of Russian embassy staff on persona non grata. While this and the response to Assad’s chemical attack appears fine, responding quickly may give the impression that not all facts and avenues were scrutinised. This then could give an indication that the British government or its related agencies would be ignoring the Chilchot inquiry or the MOD’s The Good Operation document. The most criticism on social media about the Fusion Doctrine is the ‘wheel-shape’ diagram above, especially where the term ‘Armed Forces’ is located. Yes it is tucked at the ‘south east’ corner and appears to be the only defence-related item there. By placing the word ‘armed forces’ there amongst the many other tools, it appears that the Fusion Doctrine presents the British military as just a cog in a wheel and not a key voice or player. This view or course is unwarranted since this is the National Security Capability Review, not the military-onlyCapability Review. Those who criticise that the military is sidelined, especially the House of Commons Defence Committee, journalists like Deborah Haynes all hold the biased view that the NSCR should be solely or mainly about the MOD and the British Armed Forces. This view is quite outdated as inferred by Lord Ricketts in this oral evidence (More about the separation of defence from the NSCR later) and do no service to the whole concept of the UK’s NSC in the first place. What these critics do have a point is that the voice of the armed forces or the MOD needs to be heard when the NSC chooses what mix of tools to use. The MOD and the armed forces must have a strong equal say on the same level as the other list tools in that wheel, perhaps equal to key tools such as diplomacy, development and covert forces. They say the NSCR is not a SDSR or a mini-SDSR but reviewing capabilities only. The JCNSS report specifically reported that the NSA told me the NSCR will not review the NRSA but there will be a review of the NRSA published in the later part of 2018 (see above). This is really out of place, especially since the NSCR was created due to the increasing or “intensifying” range of threats (mentioned prominently in the document) and that the NSCR occurred after the majority of British people voted to leave the European Union, the rise of an unpredictable President of the United States and the new non-state and state-based threats. The 2010 NRA, listed Tier One (most highly likely) threats as 1) International terrorism; 2) Hostile attacks upon UK cyber space; 3) A major accident or natural hazard which requires a national response and 4) International military crisis between states that require UK and allied response (see p27) (All these are not ranked in terms of likelihood, only just as Tier One.) In the 2015 NRSA, the same topics were noted as Tier One risks, with additional topics namely 5) Public health crisis and 6) Instability overseas (see p87). Yet, since SDSR 2015, UK officials and politicians increasingly saying that Russia and other nation states are becoming threats, see for example, Secret Intelligence Service Chief Younger’s speech, the Intelligence and Security Committee 2016 2017 report, sections on foreign countries, the speech given by General Sir Nicholas Carter at RUSI especially his video on Russian capabilities, CGHQ’s directors speech in April 2018, Gavin Williamson indicate than Russian is a bigger threat than terrorism, MI5’s Director General mentioning Russia as well in a recent speech and Chief of Defence Intelligence Osborn highlighting state-based threats. It is thus clear the current government views state-based threats as the biggest priority in Tier One, a clear topic not mentioned in in the previous NRSAs and only briefly stated in the 2016 Corporate Report, see page 6 paragraph 1.7. The NRSA review should therefore have been publish alongside the NSCR or in it rather than it pushed back to late 2018, where more different topics could be added to the Tier One list. A review on capabilities while perspectives on threats or actual threat is not really a review then. I’ve actually never heard the term ‘fiscal neutral’ or ‘fiscally neutral’ before but let’s use it anyway. The ‘criticism’ levelled by many parliamentarians (mainly from the House of Commons), the media (mainly Deborah Haynes from The Times and other defence journalists from other news papers), is the the NSCR’s (including the area of defence) woes could be simply solved by adding more money or pounds to the MOD’s budget. The blame, and I said it is a common and easy target to blame, lies exactly Treasury here. This can be seen in the follow parliamentary debates such as the introduction of the MDP, an emergency question on the MDP by Dr Lewis and the Lords debate about the MDP. Parliamentarians and commentators basically say, naughty Treasury, you aren’t giving enough to a department which protects the nation. Let me focus on the on the NSCR, minus the area of defence which I’ll cover separately when the MDP comes out. It is incorrect to call it a review when it shows just how there would be more joint-up approach and a sweeping ‘yes we will do this’ list. It is even more astonishing that the review was conducted due to not so-called, but actual new or evolving threats to the UK without any possible financial increase to sharpen non-military UK defence. The 2015 SDSR did say the intelligence services account and personnel will receive a financial boost in real terms. Other UK departments like the Home Department or even like DEFRA–Climate Change is an ever evolving threat don’t appear to gain any monetary increase. A clear example is the newest Home Secretary calling for more finances for the police. UK national security does require more than one hard or soft power tool or department or institution, and if the threats change, the departments and institutions cannot always address the threat if constrained by a financial box. Of course, this demand of more money comes after the NSCR, but is a relevant example on its failure for boxing in finances of these national security-linked agencies. This ‘fiscal neutral’ condition draws in more criticism, especially those cheering solely for the MOD and/or the British Armed Forces. This lot of people see the ‘fiscal neutral’ condition as an extension of the British government whether Conservative or Labour, act not to place the MOD in charge of defence reviews except in 1991 or place defence first. It brings up the argument that British national security is best or only handled by the MOD and no away should HM Treasury or the Cabinet Office constrain defence spending. More about that in the post on the MDP. The NSCR came out quite late and without a parliamentary debate, though perhaps that wouldn’t have produced constructive critique, given the current nature of Her Majesty’s opposition. It is claimed as a review, but largely contributes just a new, or rather updated concept of further joining up UK national security-related departments, agencies and tools, so that response to crises or harmful scenarios will be in one united and perhaps a more forceful response. The remainder of the NSCR does not really review but provides an multitude of pledges. Here, I tried to explain and critique the Fusion Doctrine and criticise the lack of a proper risk assessment and the failure to consider more financial funding despite the NSCR claiming that threats to the UK have ‘intensified’ or increased. As I have mentioned, there’s a more and better comprehensive critique found in the JCNSS report, even though it was published before the NSCR.